I was a huge fan of all things Peanuts from a very young age – and I still love everything Snoopy related. Upon hearing about a new release of a movie in 2015, my excitement levels went through the roof. 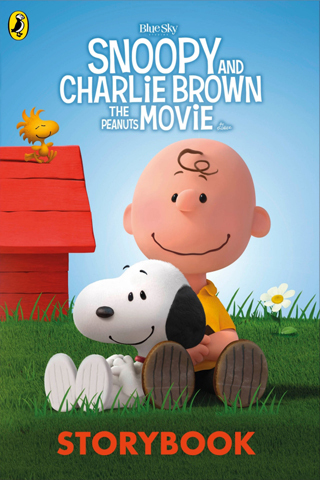 The chance to be able to see Charlie and the gang back on a big screen after all that time – and then I saw that the film would be a 3D animated affair, and my optimism for the future of Peanuts fluttered away, like Charlie Brown’s kite caught in a tree. How could you possibly take Schulz’s simple and iconic drawings and translate them into a three dimensional world? One of the pleasures of the Charles M. Schulz’s Peanuts comic strips is their simplicity. This book is illustrated with flat images from the actually 3D graphics of the movie, and the language in it has been dumbed-down considerably from the film, which seems a little pointless, really. The book doesn’t really follow the story of the movie, rather it has a character on each page with a coloured or simple background and some text describing the character. The only real thread of the story involves Charlie spending the weekend ploughing through War and Peace for a book report and him trying to get the little red-haired girl to notice him. There is of course, as ever with Peanuts, a side story throughout, involving our most loved characters, Snoopy and Woodstock. They discover a typewriter in a dumpster, and Snoopy sets about writing a novel about his alter-ego, a World War 1 flying ace, as he tries to defeat the Red Baron. The transition does work, but not in a book format. The whole point of reading a book as a child was to enjoy the imagination of the world you were entering into. The original cartoon format provided this, and although this version of Charles M. Schulz’s beloved Peanuts gang offers some enjoyable moments, ultimately it is too mellow and conventional. There isn’t as much opportunity for vocabulary development, except for describing the clothes, expressions, and features of the characters. The descriptions do have connections to elements from the film, such as kite flying, the little red-haired girl, or Snoopy Fifi and the Red Baron. Overall it is a book that works as an introduction to Snoopy and Friends, but long-time fans and die hards will find little here to come back to.